Members of the 1976 Yale crew (from left): Anne Warner, Chris Ernst, Lynn Baker, Lynne Alvarez, Elaine Mathies, Cathy Pew, Chris Stowe and Jennie Kiesling. A version of this story appears in the June 11 Women in Sports issue of ESPN The Magazine. Subscribe today! The sun is out, reflecting off the water on the Derby side of the Housatonic, but there's too much chop for a decent practice before the upcoming Ivy League championships. So the members of the Yale women's crew prepare two of their sleek Vespoli eights, one of which reads "1979 national champions." In the meantime, several male rowers work to retrieve a football from the river before it plunges over the dam a few hundred meters downstream. It's just a nice May afternoon at Gilder Boathouse, the striking cedar edifice built in 2000 and designed to resemble a boat. Looking like interlopers, two ordinary yellow school buses wait outside along Route 34 to take the rowers on the 30-minute ride back to New Haven. If you were to think of Title IX as a river, with a source, tributaries and a mouth, this is the point where the rapids began. "These women are bearing the fruits of what the 1976 crew stood for," said Will Porter, the women's crew coach. "You can be sure that before their four years are up, they will hear the story." Ah, the story. As with many legends, the facts of March 3, 1976 have gotten muddled over the years. Did it happen in late morning or early afternoon? Was Mrs. Barnett's office on the first floor, or the fifth? Did the women use lipstick or magic marker to write the words on their bodies? Time and age have played tricks on their memories. But this much everybody agrees on: It began on the school bus. 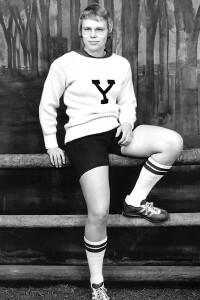 Back in 1976, women were still new to Yale, which went co-ed in 1969, and women's athletics were a curiosity often treated with disdain. Nat Case, a former Yale rower, had taken the job as the women's crew coach for all of $500 a year -- a stipend he supplemented by working at a foam rubber factory. "One basic problem," recalled Nat, "was that while Princeton and Harvard had fully funded women's varsity teams, Yale tended to treat women's sports like intramural programs." Nat Case, a former Yale rower, took the job as the women's crew coach for all of $500 a year. 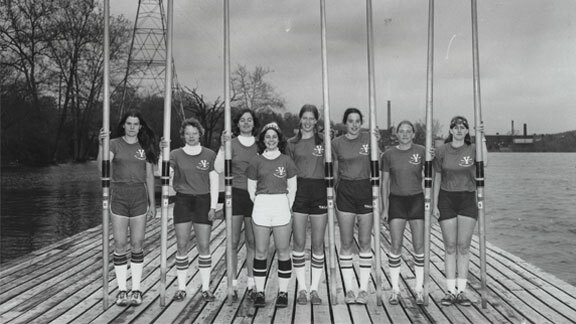 As for the rowing program, two Yale women, senior Christine Ernst from Illinois and junior Anne Warner from Massachusetts, had already made a name for themselves as members of the "Red Rose Crew," the surprising silver-medal eight from the 1975 World Championships. But at Yale, the men took precedence. In the normal hierarchy of rowing, the heavyweights picked on the lightweights, and now both groups of male rowers looked down upon the women -- quite literally. "Chris and I would be lifting in the weight room," said Warner, "while the men stood over us, hooting and calling us names. It was horrible." The men had state-of-the-art boats, but were mired in the program's worst rut (no Olympians since the 1964 Games). The women, who were far more successful, made do with antiquated, shoddy wooden shells. But the harshest indignity was the wait. After every practice at what was then the Bob Cooke Boathouse -- a Spanish-style building that was the footprint for the Gilder Boathouse -- the men would go into the showers, while the women got on the bus and waited for them. There was a small trailer with four showerheads for the women, but because Yale and the municipality of Derby were at odds over the boathouse sewer line, the facility didn't have the variance needed to get hot water. So the women sat on the bus, cold, wet, tired, and steaming that they had to wait to get back to Yale to shower. They had made countless entreaties to the athletic department and Joni Barnett, the director of women's athletics and physical education, but still, no showers. "I would sometimes work out in the morning, when nobody was there," said Warner. "But I still couldn't use the showers." In February of that Olympic year, Warner came down with pneumonia. Trapped on the bus, waiting for the men and for answers, the women talked among themselves about what to do. As Ernst now says, "Never leave the prisoners alone." Keep in mind these "prisoners" had been admitted to one of the most prestigious universities in the world because of their intelligence, talents and strength of character. Now imagine that these bus passengers included not only future Olympians, but also women who would become doctors, attorneys, professors, the owner of a WNBA team, a taekwondo world champion, the head of an all-female plumbing company ... no one at Yale knew with whom they were dealing. "We didn't know who we were at the time, either," said Mia Brandt, a junior then and now the director of communications for UNICEF. The athletic department also picked the wrong sport to ignore. 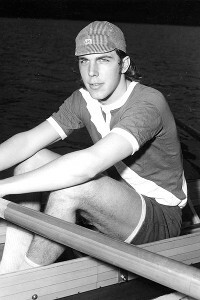 As Elaine Mathies, a freshman then who would become a national team rower (and a systems analyst and Scandinavian folk dancer) said, "One of the greatest thrills of rowing occurs when the entire boat moves together, and you feel like you have the power of the boat at the end of your oar. That's what we call 'swing.'" 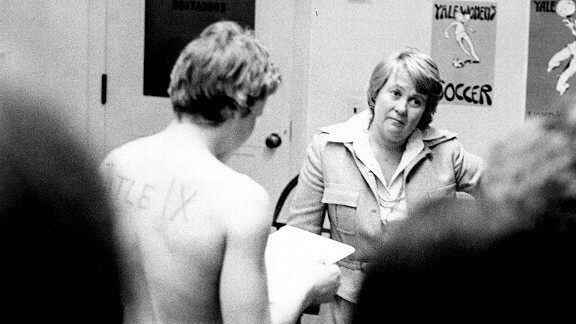 March 3, 1976: Joni Barnett, Yale's Director of Physical Education, listens as Chris Ernst reads the team's grievance. Despite their differences in size, age, ability, sexual orientation and background, the crew was literally in harmony with another. "We did a lot of singing on that bus," said Elizabeth de Bethune, now an artist and teacher, but then a freshman. "Anne, as head of the Slavic Chorus, would lead us." As the winter of '76 played itself out, someone on the bus jokingly suggested throwing Mrs. Barnett in the river to show her what it felt like. That idea was trumped by another: Let's stage a demonstration in her office where we show her the bodies Yale doesn't seem to care about. "I dare you," Anne said to Chris. "No, I dare you," Chris said to Anne. The women, many of them freshmen who would become the core of Yale's 1979 championship eight, usually took their lead from Anne and Chris. "I was the stroke," said Warner, "and Chris was the captain, the best captain you could ask for." Susan Vernon, a sophomore then and a future sword champion in tae kwon do, said, "We would have followed Chris anywhere." These are the bodies Yale is exploiting. We have come here today to make clear how unprotected we are, to show graphically what we are being exposed to ... We are not just healthy young things in blue and white uniforms who perform feats of strength for Yale in the nice spring weather; we are not just statistics on your win column. We're human and being treated as less than such. But there were a few holdouts. One of them was Lynn Baker, now the Frederick M. Baron Chair at the University of Texas School of Law. "Kind of ironic that I missed out on a protest to uphold a law and now I teach law," said Baker. "But back then, I was a sophomore from Hudson, Ohio on scholarship, working in the athletic department of all places, and I was afraid to risk that scholarship. I was torn, but I had to tell them, 'I'm not going to come with you guys.' I don't think Chris has ever forgiven me." Chris, an English major, composed the text of the grievance they would read to Barnett. Anne, a Russian history major, edited it. On the eve of the protest, they ran it by the others members of the crew, who agreed not to tell Case, partly to protect him, partly out of fear he might talk them out of it. Warner told a Yale Daily News staff member, who doubled as a New York Times stringer, of their plans. On the afternoon of March 3, they assembled in their locker room in the basement of the Paine Whitney Gymnasium. The idea of the demonstration may have begun as a lark, but it soon took on an air of solemnity, helped along by the gothic architecture of Paine Whitney. They wrote TITLE IX, or just IX, on each other's backs and sternums. "That's when the seriousness of what we were doing hit home," said Virginia Gilder, a freshman then who would become an Olympian. Then they donned their navy blue sweats and marched through the catacombs, past the workout tanks, past the stuffed bulldog who was the original Handsome Dan, and into Barnett's office in the adjacent Ray Tompkins House. These are the bodies Yale is exploiting. We have come here today to make clear how unprotected we are, to show graphically what we are being exposed to ... On a day like today, the rain freezes on our skin. Then we sit on a bus for half an hour as the ice melts into our sweats to meet the sweat that has soaked our clothes underneath ... No effective action has been taken and no matter what we hear, it doesn't make these bodies warmer, or dryer, or less prone to sickness ... We are not just healthy young things in blue and white uniforms who perform feats of strength for Yale in the nice spring weather; we are not just statistics on your win column. We're human and being treated as less than such. Once Ernst read the statement, which Ginny Gilder describes as a "Declaration of Accountability," the women put on their sweats and walked back to the locker room. "I got the call to be at the office in an hour," recalled the photographer, now Nina Haight Frost and an author ("Soul Mapping") and blogger for Marble Collegiate Church in New York City. "I didn't know what to expect -- I was a freshman -- but what I witnessed was something that seemed both profound and eloquent." Zweig, then the executive editor of the school paper and now a vice president for corporate consultant 5 Dynamics LLC, recalled, "I was the observer who didn't observe. But I vividly remember the feelings in that room. There was shock, surprise, hurt, pain, anger -- there isn't a single word that captures what went on in those five minutes." The story Zweig filed for The New York Times -- for which he was paid less than $100 and received no byline -- ran on the front page of the second section the next day under the headline "Yale Women Strip To Protest A Lack Of Crew's Showers" with this quote from Warner: "We'll probably get [showers] when Peter Pan comes back to life." "Did I really say that?" said Warner, now the International Counsel for Alexion Pharmaceuticals. "I do remember Chris and I telling Nat Case on the dock that afternoon what we did. That was hard because Nat was the one person at Yale who saw us as serious athletes -- he was a fabulous coach -- and we didn't want to get him in trouble." Senator John Kerry has called Chris Ernst the Rosa Parks of Title IX. "I was actually standing right behind Chris and Anne when they told Nat," said Jennie Kiesling, Class of '78 and now a history professor at West Point. "I heard him give out a whoop and say, 'You did what!?'" Case's coaching log for that afternoon makes no mention of the protest, only: "It was cold with flat water and we rowed three even boats and did 8 full pressure pieces of 2-½ min length just below race cadence." Said Case, "I probably wrote it at the Over The Hill Tavern in Derby. Let's just say I had a few beers that night, waiting out the storm that was about to hit." It hit alright. The next day, Case called a meeting in Kiesling's suite, where he lay on the couch, slightly hung over, and explained to the women that the demonstration had been unnecessary: the showers were days away. But by then, reporters had descended upon the Yale campus and the boathouse. "That further pissed off all the people who weren't too thrilled with us to begin with," said Jean Rappaport, then a freshman and now a librarian on Mount Desert Island, Maine. Alumni started writing concerned letters with checks enclosed, and cartoonists took pleasure in drawing naked women in a boat. Yale was embarrassed, but the lines at the trailer were quickly hooked up, and no one was punished, at least not by the school. Sue Buckholz, a junior then and now an attorney in Quechee, Vt., recalls, "My father was not at all happy at what I did. I was a townie from New Haven, and he was a Republican alderman, so he perceived what we did as ungrateful, as a slap in the face. I'm afraid he never changed his mind." By the next year, a women's locker room was added to the boathouse. "I do remember the feeling of joy being in the warm 'barnette,'" said Rappaport. "A steamy hot shower and warm dry clothes after a practice felt truly wonderful." Even more wonderfully, the cause of Title IX suddenly had a rallying cry that resonated with other women on other campuses. "About 10 years later," recalled Warner, "I was on a party boat in the middle of San Francisco Bay when I was introduced to a woman from Princeton. When she made the connection that I was on the '76 crew, she threw her arms around me and couldn't thank me enough." The demonstration took on a whole new life in 1999, when the documentary "A Hero For Daisy" came out. Made by Olympic rower Mary Mazzio, it's a delightful film -- dedicated to her young daughter, Daisy -- that chronicles the Yale demonstration and celebrates Ernst. (The film contains stirring footage of Ernst and C.B. Sands winning the 1986 world championship in lightweight doubles; their coach was Anne Warner.) Among the people interviewed for the documentary was Senator (and 1966 Yale graduate) John Kerry, who at one point calls Ernst the Rosa Parks of Title IX. 'Rosa Parks? C'mon!" Ernst is sitting in a luncheonette down the block from the offices of Pipelines, her all-female plumbing company in Roslindale, Mass. She's somewhat embarrassed that she was the focus of the film, and not terribly pleased people always point out she went from fighting for showers to installing them. Still, she's proud of what she did, and what she does. Plumbing, after all, is not unlike rowing. "We have a crew of four full-time plumbers and one part-time, though one is on maternity leave. I'm getting a little old for this, but I like the challenge. Working around Boston is like working in a plumbing museum." But we're not here to talk about plumbing. "I adore the people I rowed with," said Ernst. "That's the gift I got from Yale. Otherwise, I don't have many warm feelings for the place, and I coached there for a few years after I graduated. Even now, I still feel a real anger. The men called us terrible names. Would they use that language to describe the mothers who gave birth to them? Or the women they married? Or the daughters they would have? "That kind of stuff is still happening at Yale. That's why we have to keep fighting. That's why I'm proud of what we did. If I have one regret, it's that we embarrassed Joni Barnett. She was just the gatekeeper, and we turned her into collateral damage." In "Silver Era, Golden Moments," a book that celebrates women's athletics in the Ivy Leagues, there is a reprint of a memo Barnett sent to the administration later that afternoon, and it casts her in a more sympathetic light. She wrote, "It is unfortunate that one of our finest, most dedicated teams has been so treated and alienated. Their resentment was such that they stripped off their practice uniforms and stood naked, wearing only Title IX in ink across their chests." She then urged that immediate action be taken to get the trailer hooked up. Barnett was eventually replaced by Louise O'Neill, a dynamic woman who upgraded women's athletics while doubling as the basketball coach. Case, who had been given a full-time position earlier that year after Ernst and Warner paid a visit to the home of school president Kingman Brewster, stayed on as the women's rowing coach and won five national championships. "Looking back," said Case, who now coaches crew at the Hopkins School and teaches special education at a Connecticut middle school, "I can see how important the protest was. I may not have liked it at the time, but sometimes, history needs to be pushed by youthful, exuberant revolutionaries. They were an extraordinary crew." They proved that then, and later in life. More significantly, the splash they made in 1976 has had a rippling effect. Mary O'Connor, who went from being an Olympic rower to the head of orthopedic surgery at the Mayo Clinic in Jacksonville (and the proud mother of a daughter who's a competitive rower), said, "Title IX has given women so much. What I'm most proud of is that we showed people the backbone of Title IX. We told Yale that this treatment of women was not acceptable to us ... or to the women who would follow us." Buckholz recently attended a baby shower in which she met a prep school rower who had seen "A Hero For Daisy." "She was awestruck that she was in the company of a member of the 1976 Yale crew," said Buckholz. "I felt like a star." And Dr. Cathy Pew, a pediatrician who is on the clinical faculty at the University of Washington, said, "To my kids, ages 18 and 15, I am an old and boring working mom with too many rules. But one of my son's teachers is a U.S. team-level rower who shared the story with the rest of his class, and made my son proud." Then there's the Gilder Boathouse, which stands as a tribute to how far Title IX has come. It's named for three generations of Yale students, but it could not have been built without the support of the third, Ginny Gilder, the ex-Olympian who co-owns the Seattle Storm while serving as president of the Gilder Office for Growth investment office. "When I brought up those times at a benefit dinner for the boathouse," said Gilder, "I looked out over the crowd and saw the discomfort of some of the rowers who had called us 'sweathogs.' That gave me some closure." When Kiesling, who also coaches the Army men's novice crew, goes to Gilder, she sees something besides the stunning facilities. "What strikes me when I go back there now," said Kiesling, "is the change in the women rowers themselves. When we rowed crew, we didn't quite know how to balance being jocks and women at the same time. Now I see these women who are comfortable in both their femininity and their athleticism." The two leaders of the protest, Warner and Ernst, are still rowing because, well, they love to. As Ernst said, "We were given all these gifts -- the beauty of the boats and the water, the physical growth and challenge, the company of people who, though they are very different, love the things you love about the experience." Kiesling, whose naked back graces the poster for "A Hero For Daisy," puts it a little differently: "Someone once described rowing as having a vacuum cleaner hose stuck down your throat, sucking out your lungs, while having sulfuric acid splashed on your legs. That's the pain. But there's also the power you feel from pushing yourself through that pain, and the harmony you feel when everyone is pushing each other. That's rowing: pain and power and teamwork." Come to think of it, that also describes the swing of March 3, 1976.